At Emerson Bearing, we understand how crucial it is to choose the right bearing for the right application. If you need to extend the service life of your bearing, you must first consider the kinds of things that can cause wear so that they can be avoided or resolved. • High Speeds – If a rolling bearing is operating at a speed higher than its limit, it will wear faster, and fail prematurely. High speeds coupled with vibrations and stresses due to imbalanced forces can cause a lot of wear to the guiding faces of the cage and make the bearing run unevenly. A simple corrective action is to make sure that the guiding face cages are well lubricated. Additionally, if the bearing is lightly loaded at high speeds it may cause slip between the rolling elements and the raceway, which will also cause wear. In this case the load on the bearing should be increased. • Rapid Change of Speed – Large accelerations and decelerations can cause slippage between the rolling elements and the raceways, resulting in extensive wear. To avoid this type of wear it is possible to use bearings with smaller cross-sections and smaller rolling elements, or bearing featuring cages made of light metal or plastic, or preload the bearing axially. • Lubrication and Maintenance – As noted above, lubrication plays an important role in the maintenance of a bearing; however, the service life of a lubricant is limited. Age, environmental conditions, and mechanical stress can cause a lubricant to break down, which can result in wear. Bearing maintenance in the form of relubrication can extend the service life of your bearing, but it may not be very economical for your application. • Sealing – Choosing the right kind of seal and relative seal grease for your bearings can significantly increase their service life by preventing dirt and particles to interfere with the bearing. • Service Life and Operational Safety – In many cases a bearing will wear out before the machine in which it is used, and will have to be serviced or replaced. Unexpected bearing failure can negatively interrupt operations, but generally bearing failure is not a surprise. Failure develops over time and regular monitoring of the bearings will give you the maximum possible operational safety. The frequency of inspection needed depends on the amount of load on the bearing. At Emerson Bearing we want to make sure that your bearing has a long service life. Our Bearing Failure Analysis page provides valuable information on the causes of bearing failure and how they can be corrected to extend the life of your bearing. 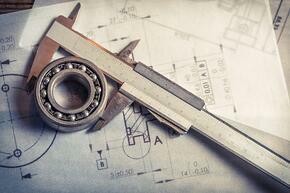 We are here to help you with all of your bearing needs. Visit our Catalog or contact us today.